Originally posted on The Nature Conservancy – Conservancy Talk on July 24, 2013. Editor’s note: The following guest post is from Rich Reid, an outdoor photographer based in Ojai, California. 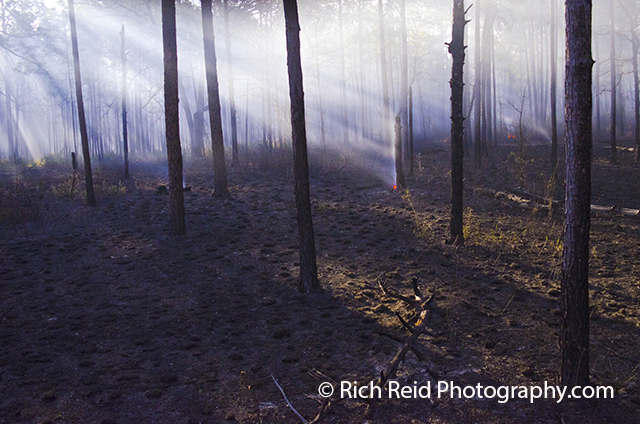 Rich recently returned from an assignment for Nature Conservancy magazine documenting the regrowth of a forest after a controlled burn. 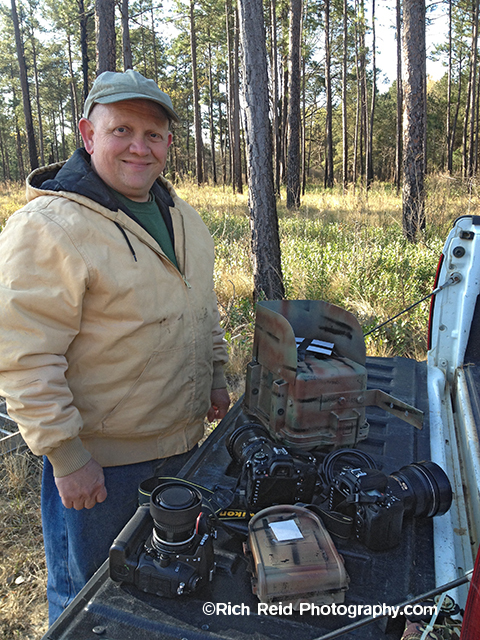 The Nature Conservancy’s Chuck Martin pulled up in his white truck and introduced himself in his friendly southern accent as I photographed a historic tobacco-drying log cabin on the 4,000-plus-acre Moody Forest Natural Area that he manages. The wealth of Chuck’s ecological and historical knowledge made this preserve in southern Georgia come to life. After decades of turpentine harvesting from the longleaf pine (Pinus palustris) and loblolly pine (Pinus taeda), plus altered land use for over a century, the Conservancy and the Georgia Department of Natural Resources partnered to create this woodland preserve in 2001 with the help from the Moody Family. I found myself in this beautiful old-growth forest on a unique mission: document the changes of a controlled burn using time-lapse photography. The Conservancy has been using controlled burns as a method to restore native habitats and control invasive plants for over 50 years on their lands. My assignment sounded simple enough… what could go wrong? Driving down the narrow sandy road through this longleaf pine and blackjack oak forest, Chuck points out the burrows of the threatened gopher tortoise (Gopherus polyphemus). As we past each “unit” I could see the obvious burn chronology on the fire-managed forest he was describing. We glided past the 32-acre scheduled burn site on our way to a beautiful cypress and tupelo slough that recently flooded from an overflowing Altamaha River. The large carnivorous yellow pitcherplant (Sarracenia lava) grew in patches of recently burned underbrush as white-tailed deer (Odocoileus virginianus) leaped through the well-managed forest. On our ride I reflected on the preparation that went into pulling off this long-term time-lapse video assignment. 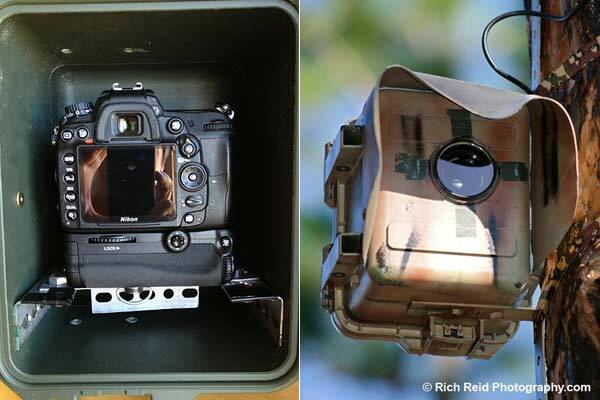 Not only did I have to build a fire-proof camera housing for my Nikon D7000, it had to survive two months out in the elements as it recorded the forest regrowth after the burn. Challenges were met each day; software limitations, hardware problems, battery issues and long days in the field. Chuck handed out satellite maps and safety briefed his professional fire crew as they measured conditions. 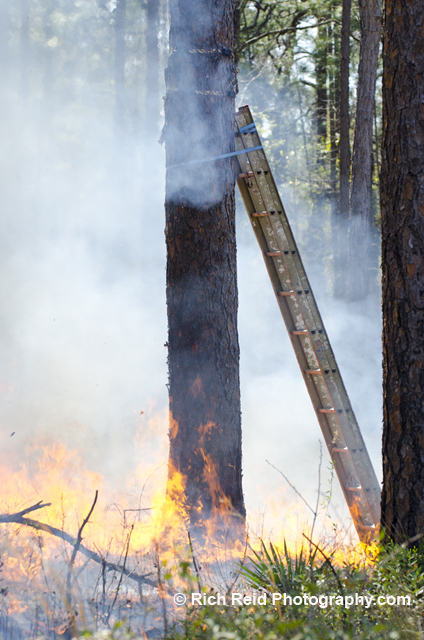 The small test fire passed inspection so the “back fire” was light with drip torches along the trail and burned predictable into the north breeze. Now for the impressive part: the fire crew scripted with precision the lighting of the “head fire” connecting the “back fire” precisely where my three cameras were filming, capturing every lick of flame. All three cameras were surrounded by fire at one point but remarkably, only a lens hood melted and the safety straps shrunk. Once it was safe to enter they burn zone, I swapped new cards and batteries to record a time-lapse of the full moon casting long shadows through the smoky forest. At sunrise, I returned for the final time to retrieve data and set up two of my cameras for two months recording the regrowth in the burn zone. Two months and one week later, I was really excited to see a large box on my porch that Chuck shipped containing my two cameras. 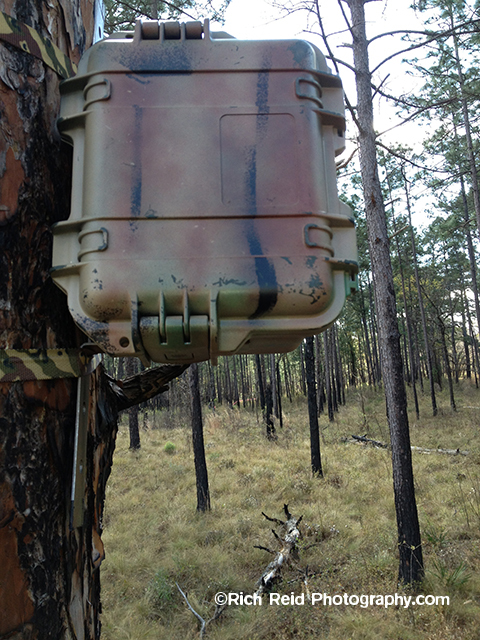 Not a day went by without thinking about my equipment 2,500 miles away strapped to a tree “supposedly” clicking away. Anxiously I opened the box that contained the answers and unbelievably they performed as planned; 1850 RAW files on one camera and 1,200 jpegs on the other. After months of planning and executing this assignment, ecstatic is the only way to describe seeing a lush green forest on the last images on each card. This couldn’t be the same forest I left a few months ago? Not only was I amused with the prolific regrowth but also amazed my cameras survived this adventure. After hand selecting the forest images, I used a range of software to auto-align, color correct and assemble thousands of still images into these time-lapse videos. Enjoy. Special thanks to Chuck Martin and Erick Brown from The Nature Conservancy and their fire crew for keeping me safe and providing this incredible opportunity to document fire in a positive way. Your work benefits the wildlife and people that depend on healthy forests. Time-lapse camera in Moody Forest. What a crazy assignment covering a prescribed fire for The Nature Conservancy. Moody Forest Natural Area is managed by TNC and Georgia DNR and covers over 4,000 acres of mixed hardwood, Longleaf pine forest and tupelo swamps along the Altamaha River near Baxley, Georgia. 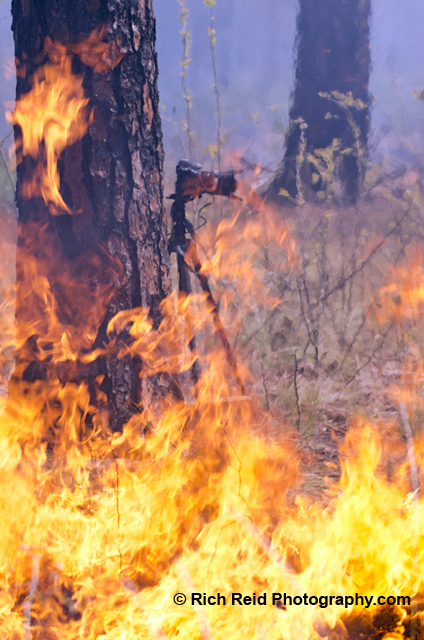 Annual prescribed fire is one management technique that The Nature Conservancy uses to protect endangered wildlife and a rare old growth forest. 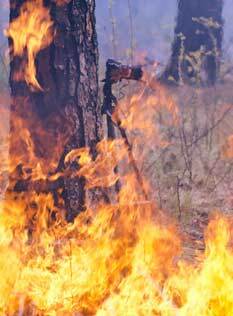 Spring is the opportune time to burn much of the non-native undergrowth in the Longleaf Pine forest. Much preparation went into pulling off a long term time-lapse video assignment of forest regrowth after a prescribed burn. To achieve my three month objective, I had to build a camera housing and create a visual script of before, during and after the fire. Challenges were met each day; software limitations, hardware problems, battery issues all while working long days in the field. Equipment used were 3 Nikon D7000 DSLR cameras, a Wingscape 8mp camera, several Nikkor lenses, two tripods and a custom pelican case housing. All the equipment survived direct fire and only the custom hood melted. The design and construction phases of the housing were entertaining however the transportation and installation not as fun. A total of 275 GB of media was captured including RAW time-lapse and still images plus HD video for the project. The editor and I are pleased with the initial results of 40 images, 2-minutes of HD time-lapse and RAW video footage documenting the burn. Many thanks go out to Chuck Martin, Erick Brown and their fire crew for keeping me safe and providing an incredible opportunity to document fire in a positive form. Stay tuned for the final video! 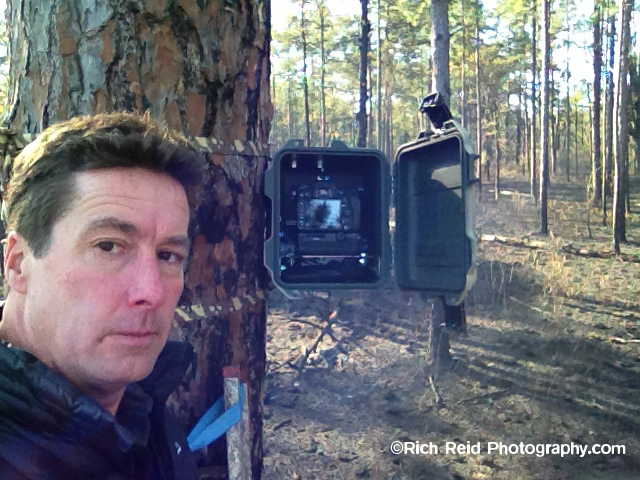 Time-lapse camera during a prescribed fire in Moody Forest. Chuck Martin of The Nature Conservancy, Georgia. 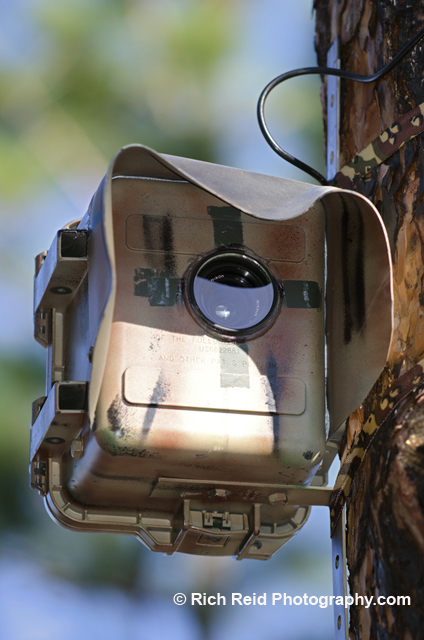 Melted time-lapse camera after a prescribed fire. Full moon frame grab from the time-lapse tree camera after the prescribed fire.